Sale Sharks maintained their unbeaten home record this season with victory over Leicester Tigers in horrendous conditions at the AJ Bell Stadium. Sale flanker Cameron Neild crashed over and Nev Edwards added a second try before Leicester's Tommy Bell dotted down to make it 17-13 at half-time. A thunderstorm early in the second half then saw play suspended for 10 minutes. 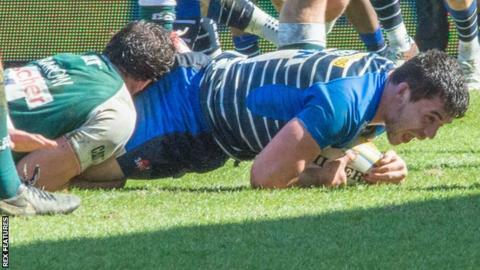 Leicester's Vereniki Goneva powered over to level the scores but Danny Cipriani's solo try won it for Sale. Fly-half Cipriani, who will return to former club Wasps in the summer, was instrumental throughout the afternoon with the boot. But, he also demonstrated his brilliance with the ball in hand as he weaved through Tigers' defence to squeeze down in the corner. Leicester camped themselves within a few metres of Sharks' try-line in the final few minutes, but were unable to find a way through to rescue a draw. The thrilling finish was part of a second half which also saw referee Tom Foley left with little choice but to take the players from the field with fork lightning and torrential rain lashing Greater Manchester. Heavy showers and strong winds also made handling and kicking difficult before the break as Leicester, who welcomed back England trio Dan Cole, Ben Youngs and Manu Tuilagi after Six Nations duty, looked out of sorts. Sale took advantage with a couple of well-crafted tries but appeared to have a stroke of luck for Edwards' score as replays suggested Will Addison, who played a part in the move, was in touch when he picked the ball up. Goneva gave Leicester a chance of completing a fine turnaround when he used all of his pace and power to make it 20-20, but Cipriani made sure Sale took their unbeaten home run beyond 11 months. "Danny will be replaced and we have replaced him already. The announcement will be made in the next week or so. "Danny sees his future elsewhere and it has been written about for months now, so good on him. "The good thing was that we had a sit down and he wants to get us as high up in the league as he can. You saw in his performance today that he doesn't look like a lad who wants to leave." "The television match official decided it was a health-and-safety risk, which is a bit bizarre really in a contact sport. "But I suppose it was a sensible thing to do and Sale played well and took their opportunities. "We'll take the point and we live to fight another day, but I think that takes our top-two ambitions out of the equation and you're fighting for top four." Sale Sharks: Haley; Addison, James, Tuitupou, Edwards; Cipriani, Stringer; Lewis-Roberts, Taylor, Cobilas, Evans, Mills, Nield, Seymour (capt), Easter. Replacements: Briggs, Harrison, Mujati, Ostrikov, Lund, Mitchell, Ford, Brady. Leicester Tigers: Bell; Tait, Tuilagi, Williams, Goneva; Burns, B. Youngs; Ayerza, Thacker, Dan Cole, Barrow, Kitchener, Pearce, Croft, Crane (capt). Replacements: Bateman, Genge, Balmain, De Chaves, Fonua, Harrison, Betham, Veainu.